Crown Meadow is easily accessed on foot from the centre of Evesham either through Abbey Park, along Abbey Road or along the riverside footpaths on the meadows side of the river. 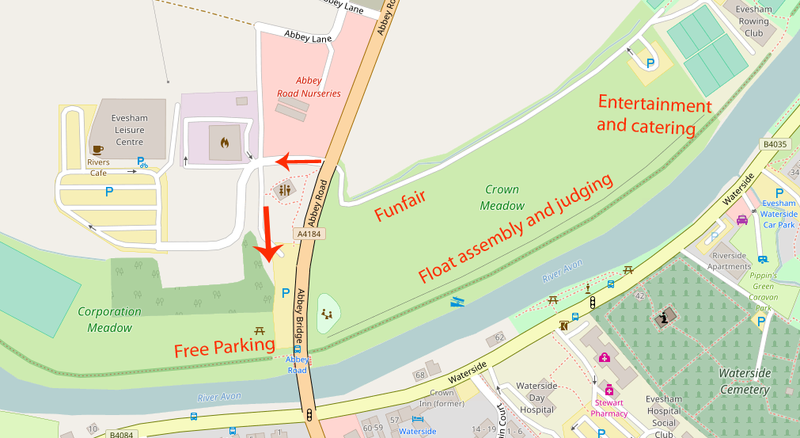 For those arriving by car, we have arranged free parking in Corporation Meadow. This is the other side of the Abbey Road Viaduct from Crown Meadow (see map) – to get to it, follow the signs for the Leisure Centre and Viaduct Meadow. You then have direct access via a level footpath along the riverside and under the viaduct to Crown Meadow. There is no public parking on Crown Meadow! The carnival takes up the entire meadow, and includes a large number of vehicles which need to be marshalled safely. For your safety, no unauthorised vehicles will be allowed on to Crown Meadow. Vehicle access to Crown Meadow is strictly for participants and service vehicles only.